Our VIP plastic cards measure 2 1/8" x 3 3/8". They are available in both 12 mil and 30 mil thicknesses Standard plastic color is white. 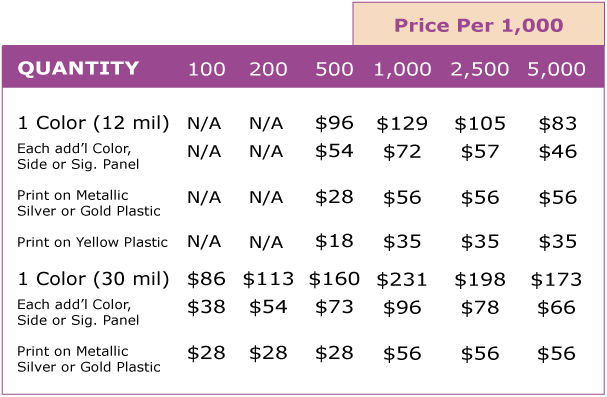 Gold and silver plastic are available for an additional fee on both thicknesses. Yellow plastic is available in 12 mil thickness. Ivory, Orange, Red, Light Blue, Hospital Blue, Navy Blue, Green and Black plastic colors are available in 30 mil for no additional cost. Standard ink colors include black, reflex blue and red. Additional colors including gold, silver, white or custom are available for an additional fee. -- None -- No. Yes. Please use the artwork on file. Get special promotions delivered to your inbox. © 2019 Biz-Mag.net - All Rights Reserved.